Everything is ready for the most anticipated music festival of all, one that was created to celebrate the magical sunsets that happen take place in a most unforgettable setting: Mexico’s Pacific Treasure. The Riviera Nayarit has declared itself ready to “Experience Summer” with the arrival of several big musical events. One of the most anticipated is Corona Sunsets 2017, a beach festival inspired by the destination’s magical sunsets—and the perfect stage for this July 22nd event is the traditional town of San Pancho. The idea is to relax, meet new people, dance and have fun by the beach while celebrating the sunset to the beat of electronic music. 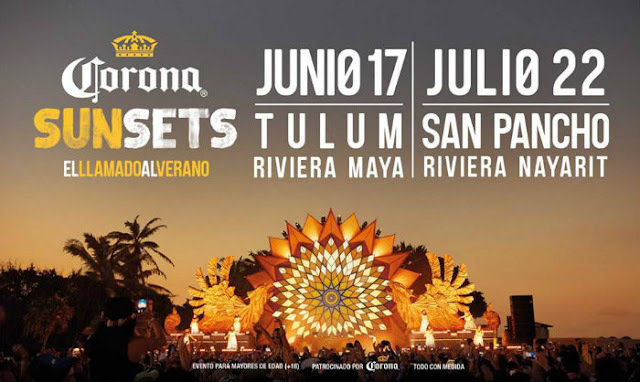 For its fifth year in Mexico, Corona Sunsets 2017 is offering a top-notch lineup of national and international DJs playing on a matchless stage: Duke Dumont, Bakermat, Goldroom, Mexican Dubwiser, Telefunka, Salón Acapulco, Vintage Culture, Bruno Martini and Tini Tun. Meanwhile, this year’s event is also behind the Eco Challenge, a sustainable program that is committed to protecting 100 islands for 2020. During the festival the program will be jump started with the support of the Ocean Guardians, which will be handing out stickers to everyone who takes action to keep the festival clean and in harmony with nature by recycling cups, throwing trash into the correct bins, keeping cigarette butts in a safe place, etc. The stickers can be exchanged for amazing prizes. The doors of the Hacienda San Pancho will open at 2 p.m. on Saturday, July 22 for those who arrived on the free transportation, as the place does not offer parking. There will be two departure points, one is the parking lot of the FIBBA in Nuevo Vallarta, the other is at the Sayulita baseball diamond, where festival goers can exchange their previously purchased tickets for the access bracelet. It’s important to note that neither taxies nor private vehicles will have access to the Hacienda San Pancho. All attendees must board the free transportation at the above mentioned departure points. Continuous departures begin at 1 p.m. Official IDs are a must and the festival concludes at 12:30 a.m. Besides the five events that have already taken place in Mexico, Corona Sunsets has been held in England, China, Italy and Dubai, among others.